What if you could just create a regular HTML file, put it in the File Cabinet and then render it into a suitelet? And what if you could use one line of code to inject values from NetSuite in the correct place in the HTML? This could be search results from the use of my search function. // Check if noEscape is passed, if it is and if true then don't escape value. // This is needed when value contains HTML code. The last (optional) argument “noEscape” decides if the value should be URL encoded (false/omitted) or not (true) using the function nlapiEscapeXML(). In most cases you don’t need to specify this argument, but if you need to pass HTML or other code into the function you need to set it to true to avoid the code being modified. As you can see in my example above, I get the NetSuite URL for my CSS files as well. Instead of hard coding the NetSuite URL into the HTML page, I calculate it and insert it when the page is loaded. Not only does it make the page easier to read the code, it also makes it much easier to maintain. This can also be used to generate XML files to convert into PDF. As some may already know I was recently laid off after 14 years as a Notes and Domino developer at my workplace. I suspected for a while that some staff reduction would be coming soon, but I was a bit surprised that I was included since I am the only Notes developer in the company. I had for a while considered to do consulting and freelance development. My wife as well as several friends have been encouraging me for years. So this was just the push I needed. I am starting my own company, Demand Better Solutions, where I will focus on Notes and Domino Development, application modernization and migration as well as building brand new web applications and websites. I realize that me being laid off is just a business decision. It is not personal. Several of the business critical applications at my former employer are developed using IBM Notes, but the executives have for years been talking about moving away from the platform. Of course they don’t realize the huge amount of work needed to do this, but never the less this was/is their ultimate goal. The reason is that they feel (based on what they hear from other executives) that Notes is old technology. The fact that IBM has been slow in modernizing the interface, and that many of the templates still look like back in 1999 when version 5.0 was released does not help this perception. My old employer also uses Visual FoxPro, a product where the last version was released in 2004. It has officially been discontinued by Microsoft, but we use it for several important applications. So I don’t think that even a product being discontinued is driving a huge number of migrations. It is the perception of how modern the product is that matters. And that perception is almost 100% the way the product looks. To a user the interface is the product. Create a modern looking application and nobody will question (or care) what tool was used to build it. The last 3-4 years I have been learning new web technologies, like jQuery, Bootstrap, Ajax, JSON. I have been able to use much of that at work, as well as in several side projects. I also started learning C# and .net. After the layoff I sat down and started looking at (among others) php and mySQL as well as researched frameworks like AngularJS. As a developer I have to keep up with new technologies, or I will be left behind. But it is hard when you work full-time, have side work and then have a family and house to take care of. Having some free time the last few weeks enabled me to focus on learning some new things. I don’t think the Notes client will be developed much more, almost everything is moving towards web applications these days anyway. But IBM Domino is something totally different. It is an very capable and powerful development platform. With some skills in web technologies and a good understanding of the Domino platform one can build some amazing applications. IBM recently released FixPack 7 and announced that the current version of Notes and Domino will be supported for at least five more years, until September 30, 2021. New functionality will be provided through Feature Packs, not version upgrades. But Domino is just one tool of many. I am looking at LDC Via as another data store, as it very closely resembles Domino with a MongoDB-based NoSQL backend. Salesforce also has many similarities with Domino. The transition would therefore be fairly easy. AngularJS is another popular technology, with version 2.0 soon to be released. And we of course have IBM’s BlueMix offering, where MongoDB is just one of many technologies offered. As a developer we need to learn new things constantly, the language or tools we use does really not matter. We should pick the proper tool, whatever fits the project. Do you want to modernize your Notes and Domino applications? Let me and Demand Better Solutions help you! I have been selected to present at MWLUG in Austin on August 17-19. My presentation will be kind of part two of my presentation last year in Atlanta. It will focus less on the basics and go more into the fun and more advanced stuff. Kind of an extended version of my Connect 2016 presentation. I will also discuss the difference between JSON and JSONP and why the latter usually is better when building this type of integration. You will leave with a sample database containing the source code all the demos I will be showing as well as Lotusscript script libraries with classes I built to easily build agents that will interact with the website. I hope to see you in Austin in August! If you haven’t registered yet, go ahead and do it now! There are still seats left. As I promised, I would post my IBM Connect 2016 presentation on my blog. You can also find the presentation on SlideShare.net. To the right you see the database design, you want to look in the Agent section for the agents and in the Pages section for the HTML pages. Note: You need to sign the database with an ID that have the proper rights. Otherwise the code will not work. You can find my presentation from yesterday here. I plan to publish the speaker notes soon, after I clean them up some. Microsoft today released the latest version of their development environment Visual Studio. There are even free versions, including the complete IDE Visual Studio Community and the code editor Visual Studio Code (available for Widnows, Linux and OSX). Visual Studio now includes even more tools for cross platform mobile development for iOS and Android. There is even an Android emulator included. The web development part supports tools and frameworks like Angular, Bootstrap, jQuery, Backbone and Django. And naturally the IDE also supports Windows, including Windows 10 (expected to be released at the end of the month). I have been using tools in the Visual Studio family for many years, I started with a beta of Visual Basic 1.0 a long time ago, and used all version up to and including VB 6.0. I also played around some with Visual C++ and even Visual J++. After that I focused mainly on Lotus Notes development, but recently I have started some C#/.NET projects at work using Visual Studio Community 2013. MWLUG in Atlanta – I will be presenting! It is less than 7 weeks left until MWLUG, the Midwest Lotus User Group conference. This year the conference takes place in Atlanta, between August 19 and 21. During the three days there will be over 40 technical session and workshops on collaboration, receptions and networking opportunities, as well as access to experts of IBM solutions, both from IBM and other companies. The topics includes application development, system administration, best practices, customer buisness cases and innovation/future plans by IBM. Breakfast and lunch is included for two days as well. And all this for the cost of only $50 per person! The event takes place at Ritz-Carlton in downtown Atlanta. There is a block of rooms reserved at a special conference rate of $149.00 per night. One of the sessions will also mark my personal debute as a speaker at a conference. I will present “Break out of the box – Integrate existing Domino data with modern websites” where I will talk about how to integrate websites built either within Domino or on other platforms with backend data that resides in a Domino database. I will talk about how you can build a modern looking website using tools like jQuery and Bootstrap and seamlessly integrate them with existing data on your trusty Domino server using JSON and Ajax. I will also provide plenty of example code ready for you to bring home and start playing with. A number of IBM Champions will be presenting, as well as IBMers and other industry experts. So no matter your interest, I am sure you will find plenty of good sessions. I am sure I will have a hard time picking which sessions to attend! So what are you waiting for? Go to http://www.mwlug.com and register! See you there! While working on a web form using Bootstrap, I ran into a very strange issue with the grid system. I am not sure if I should qualify it as a bug, but it is definitely very annoying, and not the expected behavior. What happened was that when the browser window was smaller than the breakpoint for col-sm (less than 992 pixel wide), the input fields became semi-disabled. I could not click on them to select them and enter values, and the cursor did not change into an insert-point like it should. For all purposes it looked like the field had been disabled. But using the tab key, it was possible to go to the field and enter values. When I made the browser wider, it suddenly worked again. The issue occured in IE and Firefox, both the latest versions. 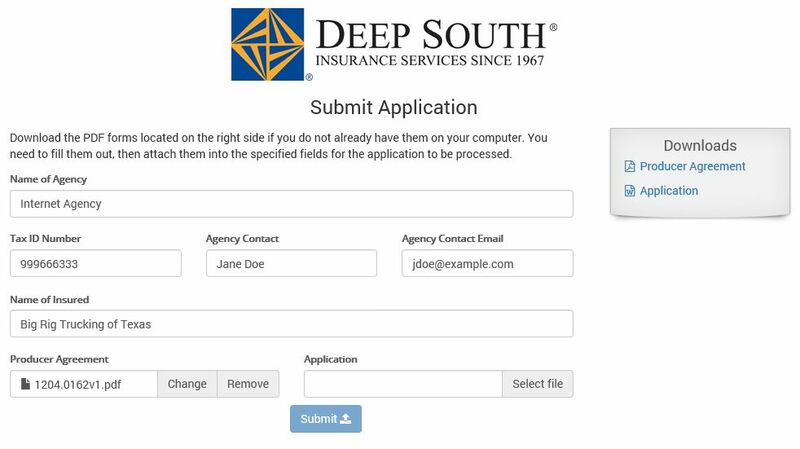 This week I was asked to create a simple web form where customers could fill out a few fields, attach two files and submit it for review. The document with the information and attachments are saved into a Domino database, so it can be processed thought the Notes client by the internal staff. These days I mainly use Bootstrap (and jQuery) to design the webpages, since Bootstrap makes it very quick and easy to get a nice clean look of the page. Using jQuery allows me to do some nice manipulations of the DOM, hiding and showing sections as needed for example, or disable the submit button until all required fields have been filled out. It has been a long time since I worked with the file upload control in Domino, and it was as ugly as I remembered it. But I knew I had seen some nice jQuery/Bootstrap file upload controls, so I located one that I liked in the Jasny plugin library. If you haven’t already, take a look at those components! So how do I tie this control to the Domino file upload control? As so many times before, Jake Howlett and his excellent site CodeStore comes to the rescue. He wrote an article back in 2005 about how to fake a file upload control, and that code can be used as-is, and combined with the Jasny plugin. It all worked perfectly. I was able to attach the files and submit the form, and the files showed up in the Notes client. What I did not like was the dreaded “Form processed” message. I tried a few different things, using the $$Return field, etc. But nothing worked. Of course, if you are able to use XPages, there are nice file upload controls there that you can use. Earlier this year I was asked to research some alternatives for a web-based password reset function at my work. One of the larger support burdens are users who forget the passwords, especially in the first few days after changing it. We have a 90 day password lifespan, then a new password need to be picked. Some users wait until the last minute, which usually is Friday afternoon right before they go home, making it very likely that they will forget the new password over the weekend. Another big group is auditors, who may come in every 6 months or so, and by then their passwords have of course already expired. I first looked at some COTS solutions from HADSL (FirM) and BCC (AdminSuite). They were both very competent, and in addition have several other functions that I really would like to have in my environment (like synchronization between Domino Directory and Active Directory). However, as my company is in a cost saving phase, I was asked if I could build something myself, so I played around a little, and came up with a small and simple application. The application contains two web pages. 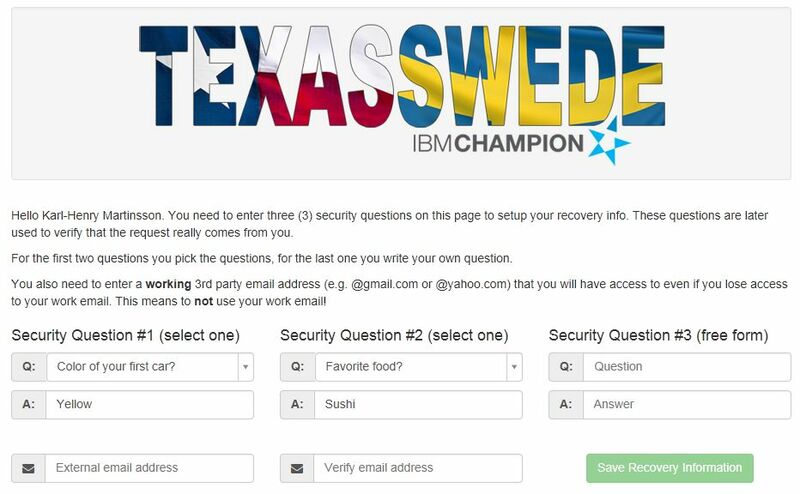 The first page (Setup) is where the user will setup the security questions used for password recovery as well as entering an external email address that they have access to even if locked out from the Domino account at work. This page is protected by regular Notes security, so the users need to set this up before they lose access to their account. The second page (Request)is where the user can request the password to be reset. 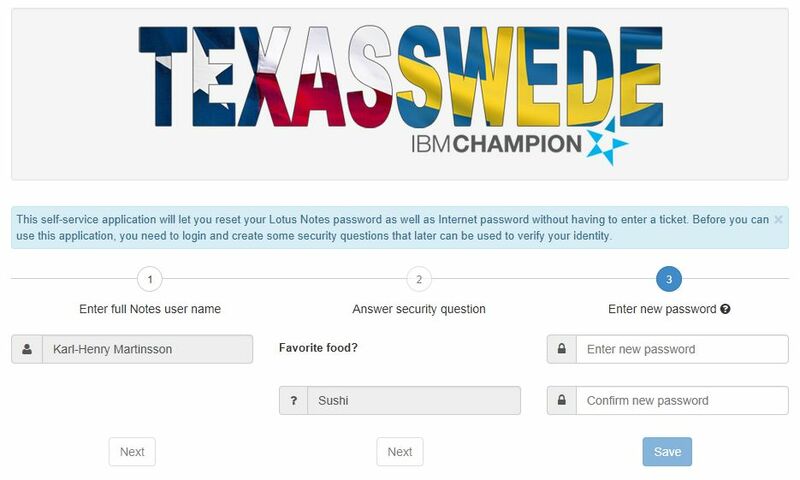 After entering their Notes name, the user is presented with one of the security questions. If the question as answered correctly, the user can now enter a new password. If the question is wrong, another of the questions is presented to the user. I am also using regexp to make sure that the password match the requirement our organisation have for password strength. When the user fill out and submit the setup page, a document is created in a Notes database. When the user need to reset the password, the security questions and answers are retrieved from that document. To prevent unauthorised access to the Notes documents, they use Readers fields to prevent them from being visible to anyone but the signer of the agents running on the server. This application can of course be updated with more functionality. Instead of allowing the user to pick a password, one could be generated by the server and sent through email to the address entered during setup. There are probably other things that can be done to adapt this application to the needs of your organization. And you probably want to change the logo on the pages to fit your organisation. You can download the application here. It is licensed under Apache 2.0. I will try to get it up on OpenNTF.org soon as well. Read the “About” page for instructions on installation and setup, as well as full license and attribution. Enjoy!